Go paperless from investment prospectus documents. Most banking institutions have a paperless option, which I’ve signed up for over the years for general banking. However I am hesitant to go paperless with my investments out of paranoia – what if a robot deletes my account and I have no proof of my recent balances? With emailed statements I’ve encountered missing credit card bills from going paperless – no fun when you’re dinged with a late fee and interest rate increase. 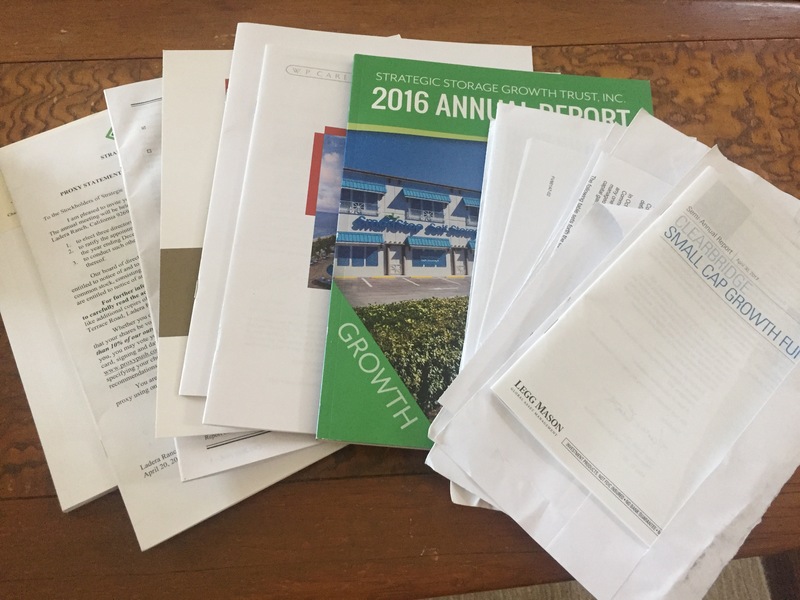 So I’ve left 401k and mutual fund statements in the paper rotation, however I recently found out I can opt to go paperless with the most pulp wasting documents – prospectus and proxy voting. This has been a good option because I don’t have the time to read a prospectus on a $500 investment each quarter of the year! Multiply that by ten investment products and the paperwork starts to add up! Most banks have a “Go paperless” option in your account settings online. The financial planner I use has a customizable menu where I can pick and choose which documents to go paperless with. It took about two minutes to make the change, which will save trees, carbon, and my time going through them. Give it a try – if your bank doesn’t have that option – ask them to create one! Next Post Clearing clutter – New Year!